A little while ago I finally had a chance to try out the Braid demo. All thanks to Steam. Since I don't own a 360, I've been waiting for the Steam release for a while. At this point, Braid is nothing new really, and anything I may write about it feels like retreading whatever might have been said already. Still, I feel I should at least make mention of the game. It's been a curiosity in the indie scene, which I also appear to be getting more and more out of touch with. 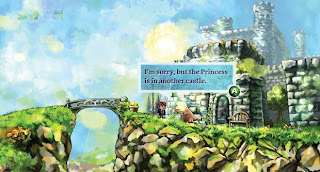 What does keep Braid relevant to me perhaps are its artistic attributes. While the references to Mario are entertaining, the depths of Braid's story seem intriguing right now more for its psychologically constructed nature. Meanwhile, the painted look appeals to me as well. As the character moves forward, each world moves with it in order to enhance the sense of time manipulation in Braid, which is a very nice feature. Add to that a wonderful musical score and pleasantly challenging puzzles, and this game seems right now to be full of promise to me. I haven't had time to get the full version and play it through, but rest assured I intend to. I'm very curious about how the story will unfold, and whether the pleasant removal of death within the game will be enough to make the experience less masochistic than the afore referenced Mario Bros.